Ready to get Certified? Register to take your exam below. Need some training before getting Certified? See the various Six Sigma Training options available to you. A Council for Six Sigma Certification (CSSC) Certified Lean Six Sigma Yellow Belt is an individual who has attained a basic knowledge of Six Sigma, but does not lead projects on their own. They are often responsible for the development of process maps to support Six Sigma projects. A Yellow Belt participates as a core team member or subject matter expert (SME) on a project or projects. In addition, Yellow Belts may often be responsible for running smaller process improvement projects using the PDCA (Plan, Do, Check, Act) methodology. PDCA, often referred to as the Deming Wheel, which enables Yellow Belts to identify processes that could benefit from improvement. These smaller Yellow Belt projects often get escalated to the Green Belt or Black Belt level, where a DMAIC methodology is used to maximize cost savings utilizing Statistical Process Control. The Council for Sigma Certification (CSSC) offers 2 different paths to earning your Lean Six Sigma Yellow Belt Certification. Individuals who have already received training and feel that they have significant understanding of the topics covered in the Yellow Belt Certification “Body of Knowledge,” can simply sit for our standard comprehensive examination. Individuals who are using one of our free Self-Study Guides, either independently or in conjunction with a training provider, can instead sit for several short exams as they progress through the different sections (as opposed to a single large comprehensive exam). As an added benefit, those seeking the second option towards Certification would be able to obtain the various levels of our standard certifications (White Belt, Yellow Belt, Green Belt, and Black Belt) as they progress through their certification journey, without incurring any additional examination fees. Either path will award our official certification(s). Either path is an open-book and non-timed examination format. We feel the Multiple Exam path to be the most beneficial option for those who are newer to the methodology, professionals looking for a solid refresher, or those candidates who would like to reduce their overall examination/certification costs. Who are only seeking a single level of certification. Who are utilizing one of our free Self-Study Guides either independently or in conjunction with a training provider. Looking to earn the various levels of “Belts” as they progress, without incurring additional examination fees. That feel they may need more than 3 attempts to pass the examination. The Official CSSC Lean Six Sigma Yellow Belt Certification standard exam consists of 50 questions. It is non-timed and is an open-book format examination (we encourage the use of the free Self-Study Guide issued by The Council for Six Sigma Certification while taking the exam). The Exam consists of multiple-choice and true/false questions from the major sections of CSSC Lean Six Sigma Yellow Belt “Body of Knowledge.” The Official CSSC Six Sigma Yellow Belt Certification exam can be taken either online (utilizing the link below) or at designated testing centers located worldwide. The current examination assessment fee is $150.00 USD Limited Time: $79! Learn More (other major currency options are available during payment). Applicants will have 3 attempts to successfully pass the exam with the required minimum score within 12 months of registering (see below). If unsuccessful after 3 attempts, the student would need to pay the examination assessment fee again. To successfully obtain the professional designation of a CSSC Certified Lean Six Sigma Yellow Belt (CSSC-CSSYB) issued by The Council for Six Sigma Certification, candidates must successfully complete our CSSC Six Sigma Yellow Belt Certification Exam and achieve a score of 140 points (or higher) out of a total 200 possible points. There are no prerequisites for taking the CSSC Lean Six Sigma Yellow Belt Certification Exam. Once the examination assessment fee is paid, you will have 1 year to successfully pass the exam. There is no project requirement for this level of Certification. We recommend that any individual wanting to successfully pass the official CSSC certification exam, obtain Six Sigma training either through a qualified training provider or by studying the free self-study guide issued by The Council for Six Sigma Certification. For those candidates already proficient in the Lean Six Sigma Yellow Belt methodology, we highly recommend that they review both the free self-study guide and the corresponding “Body of Knowledge”. After successfully fulfilling the certification requirements, candidates will receive an Official CSSC Lean Six Sigma Yellow Belt Certification issued by The Council for Six Sigma Certification, the most respected accrediting organization in the Six Sigma industry. Our certifications have no expiration date. We strongly feel that certifications that require “renewals” only serve to increase the profits of the certification providers instead of benefiting the individual. Or put another way, a Master’s Degree in Business does not expire… why would a professional certification? Candidates who would like to obtain a more recent certification date can always resit for the certification exam at any time (often for less money than a provider would charge for a “renewal”). 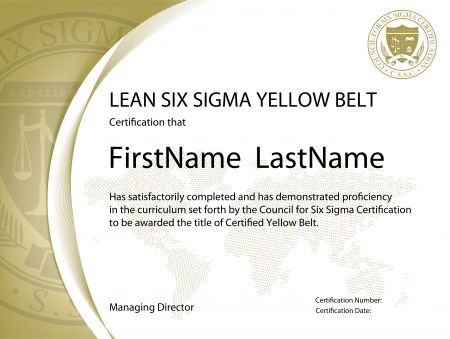 Upon completion of the requirements, individuals are issued a Lean Six Sigma Yellow Belt Certification in an electronic form. All certifications contain a verifiable certification number and the certification holder is added to the Council for Six Sigma Certification Official Register. The “Self-Study Exams” option is a flexible option for candidates who would like to have the ability to obtain the various levels of our standard certifications (White Belt, Yellow Belt, Green Belt, and Black Belt) as they progress; without incurring any additional examination fees. This alternative path to certification is designed for candidates utilizing our free Self-Study guides (either independently or through a training provider), or candidates seeking a more comprehensive path towards their Certification goals. Simply put, for each chapter of the Self-Study Guide, there is a corresponding exam. Each time the individual completes a chapter of the Self-Study guide, he or she will take a short (10-15 question) online exam. The exams are available to be taken online 24 hours a day, 7 days a week. They are both open-book and non-timed. After multiple exams are successfully passed (requiring a minimum score of 70% on each exam), a new level of Six Sigma Certification is awarded. As illustrated above, the Lean Six Sigma Yellow Belt Certification exam consists of 11 separate chapter exams (between 10-15 questions each). The current examination assessment fee for the Self-Paced Exams option is $500.00 USD Limited Time: $349! (other major currency options are available during payment). Applicants are provided with an unlimited number of attempts to successfully pass the exams within 12 months of registering. If necessary, extensions can be obtained here. To successfully obtain the professional designation of a CSSC Certified Lean Six Sigma Yellow Belt (CSSC-CSSYB) issued by The Council for Six Sigma Certification, individuals must successfully complete each of the 11 self-paced CSSC Six Sigma Yellow Belt Certification Exams and achieve a minimum score of 70% on each individual exam. Other Certifications are also available as stated above. There are no prerequisites for taking the Self-Study Exams. There is no project requirement for the Self-Study Exams. We recommend that any candidate looking to successfully pass an official CSSC certification exam obtain Six Sigma training, either through a qualified training provider or by studying the free self-study guide issued by The Council for Six Sigma Certification. For candidates who are already proficient in the Lean Six Sigma Yellow Belt methodology, we highly recommend that they review both the free self-study guide and the corresponding “Body of Knowledge“. After fulfilling the certification requirements, candidates will receive an Official CSSC Lean Six Sigma Yellow Belt Certification issued by The Council for Six Sigma Certification, the most respected accrediting organization in the Six Sigma industry. Candidates who would like to obtain a more recent certification date can always resit for the certification exam at any time.